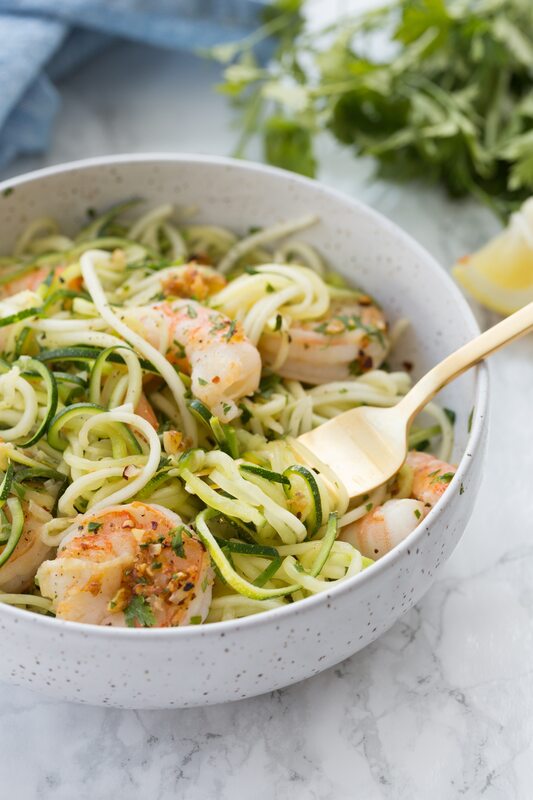 This gluten-free shrimp scampi recipe with zucchini noodles is Paleo, Keto-friendly, zesty, healthy, and an easy weeknight dinner. 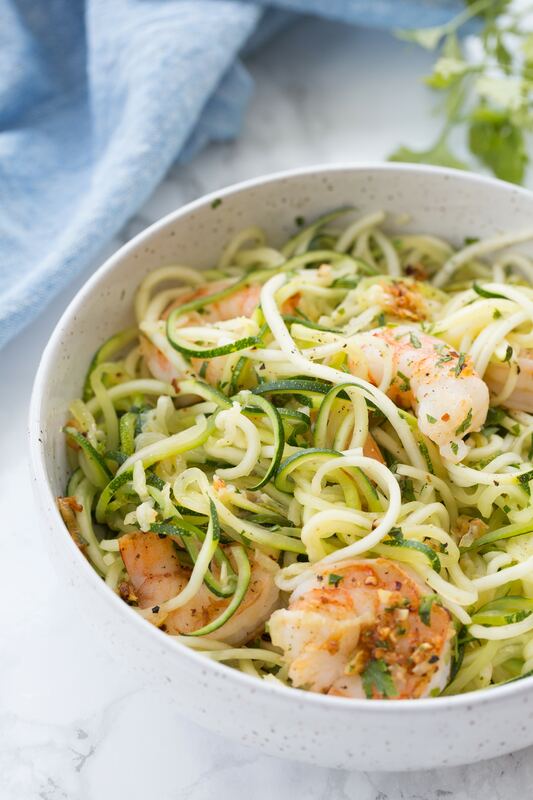 When I first started this blog, I was never worried about coming up with spiralized recipes, because there are so many cultures that incorporate noodles and rice into their diet, that I knew I’d always have inspiration. Like, for example: shrimp scampi! Shrimp scampi is one of those zesty, light, and flavorful meals with very few ingredients. Thanks to garlic, fresh herbs (parsley), pepper, and shrimp, the pasta dish is robustly flavorful. 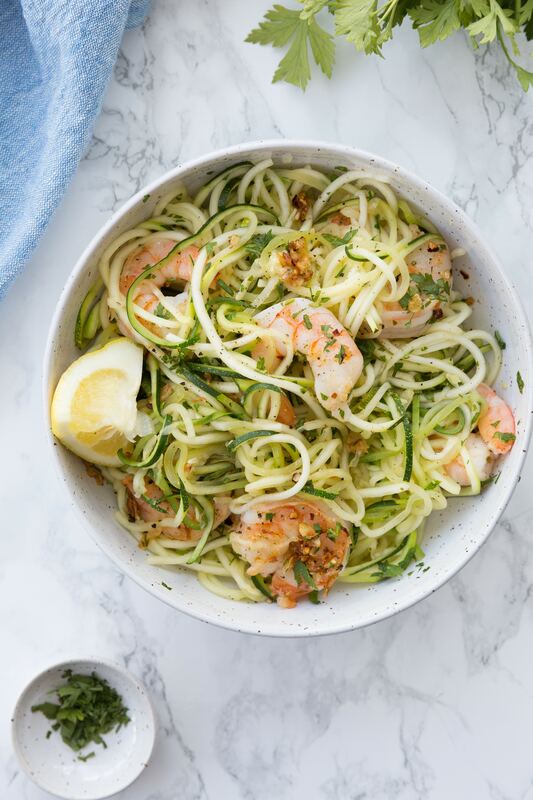 With a simple swap in of zucchini noodles for pasta, we have a lighter but just as flavorful, #inspiralized version of Shrimp Scampi! I hope you all enjoy the rest of your weekend! It’s a beautiful, picturesque, HOT summer day out today, so we plan to take Luca by the pool to cool off and splash around! Juice half the lemon and quarter the other half. Heat the oil in a large skillet over medium-high heat. Once oil is shimmering, add the garlic and red pepper flakes. Cook the garlic for 30 seconds or until fragrant and then add the shrimp, season with salt and pepper, and cook until just pink, 2 minutes per sode. Stir in half of the parsley and half of the lemon juice, stir well, and pour the shrimp into a bowl to set aside. Immediately add the zucchini noodles to the skillet and cook until al dente, about 5 minutes. Add the remaining lemon juice and parsley and toss. Divide the noodles onto plates using tongs and top with cooked shrimp and season with additional cracked pepper. What kind of oil and how much to use? Help! Making this recipe tonight!!!! Thank you! Can't wait to try your smoke and mirror trick. M.
Doesn't scampi have white wine in it?